Just ignore the fold lines and loose threads for now! Whyyyy? I thought I had this figured out when I changed to the pin feed. 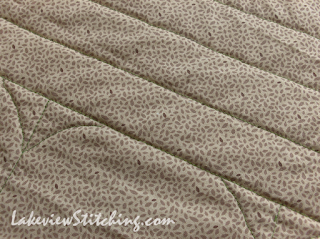 Somehow the top and bottom layers are feeding through at different speeds, and it must have something to do with the crosswise vs. the lengthwise grain of the backing fabric. But, it is practically ruffled, so it must come out, and that has been taking forever. Once the straight lines are unpicked, I'm going to do a free-motion stipple, which I think will be more forgiving. And at least, after all those clover motifs, I am feeling better about my free motion abilities. In February, when I was having similar trouble quilting Mod Trips, I said to myself, "this is the last large quilt I am quilting at home." But you know, it turned out well in the end, and everyone liked it, so basking in the glow of success I forgot all the pain! 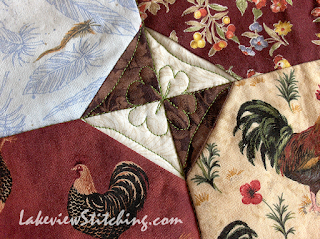 But in March, facing all the same trouble again, I really started to resent the time that quilting was taking from my other projects. 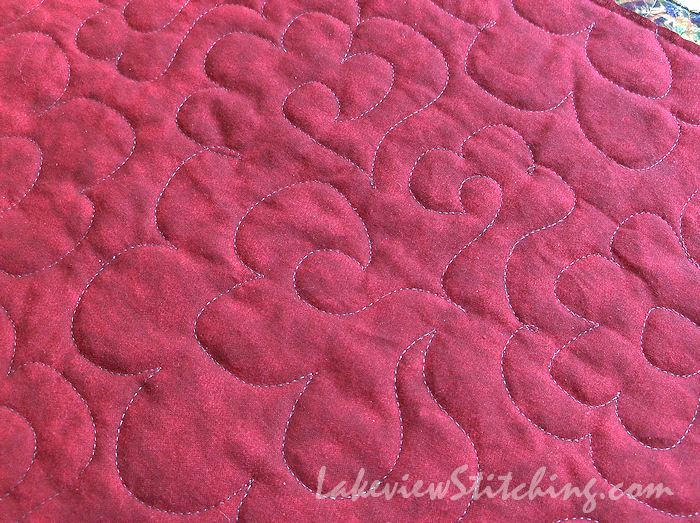 I decided it's finally time to invest in some rental time on a long arm quilting machine. Yesterday I took my Cardinal Stars flimsy to a local long arm dealer that offers rentals. 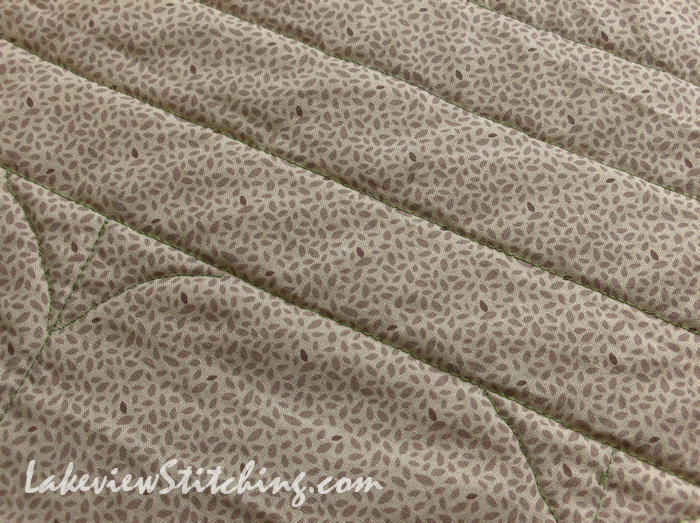 And after about one hour of class time and three hours of quilting time, it is quilted! By me! On the back here you can see the pantograph I used, Cloud 9. I am not always the biggest fan of pantos, because they can be a little uninspired, but I have to say they are quite forgiving even when you are never right on the line! It is a good way to build your skill and still have a decent result. The polyester thread was my biggest hurdle in deciding to try a long arm. 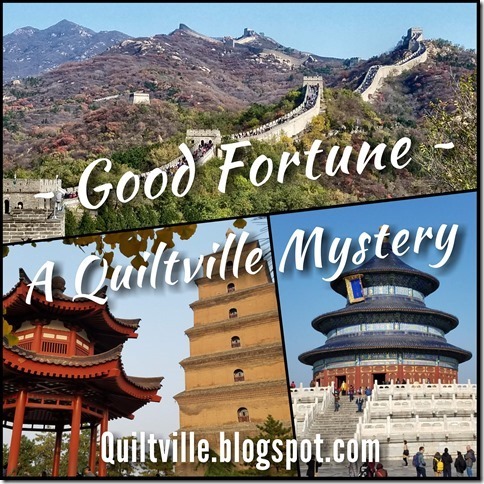 (And the money, of course, but I decided to re-allocate my fabric budget to quilting for a while.) I deliberately took these photos to highlight the thread. It is shiny polyester Glide thread, but not this obvious in every light. 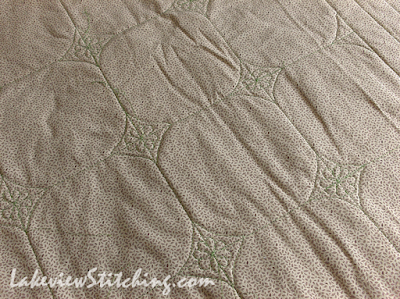 I can see why longarmers like it, because it is perfectly smooth and even, with no fluff, even after quilting the whole quilt at high speed. I like it better than I expected, and in future, I will have the option of bringing in my own cotton thread. Now that it is home I cannot believe how much quilting I did, and that it is reasonably good looking to boot! 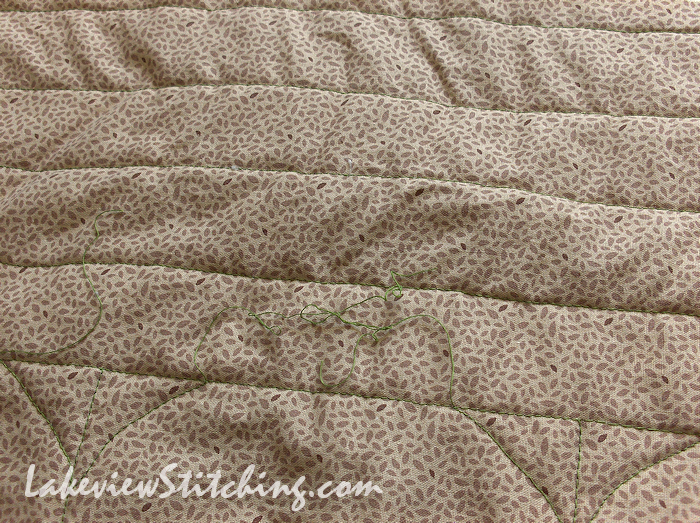 I am sore, but not any more sore than after a day of quilting on my home machine. 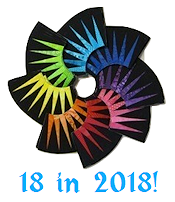 And, with one day on the long arm I accomplished more than a month of quilting at home! 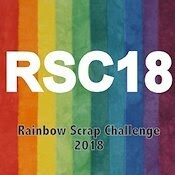 So yes, I'll be doing that again. For me, the "aha moment" was when I was basting the edge of the quilt before following the panto across the middle. 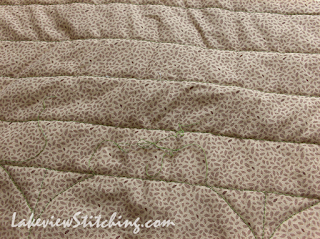 When I baste the edge of a sandwiched quilt on my home machine, it stretches and puckers and slides around and generally tests my patience to the limit. On the frame of the long arm the edge of the fabric doesn't move at all, and it is easy to sew a scant 1/8" from the edge. Everything stays straight. Amazing! Now I have a list of new things to try on the long arm, which should use up my stack of flimsies, including Collector, It's Warm Inside, Picnic, and Circa 1998. 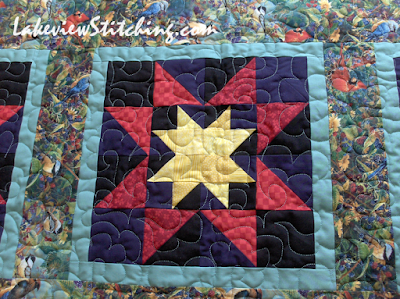 Although, now that I see how easy it is to quilt a large quilt this way, I am once again considering adding a border to Circa 1998 to bring it up to queen size. We'll see how it goes! This is fantastic, Monica. It seems like a big breakthrough to me. 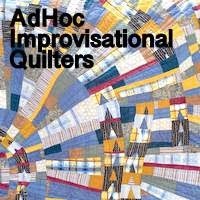 I know many quilters take their work to be professionally quilted but I had no idea you could use such a service to do it yourself. 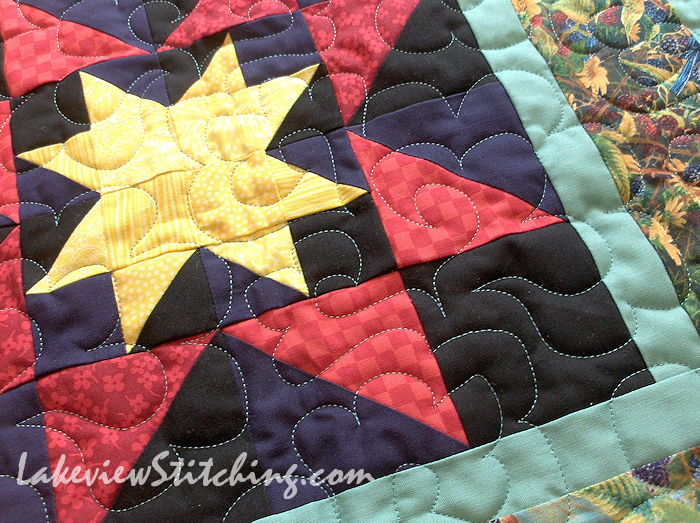 I really like your Hen Party quilting - but your effort with Cardinal Stars is lovely. Good on you! Wow! Amazing work on the long arm! Had you ever tried a long arm machine prior to this? Your Cardinal Star Quilt looks quite professional. Is there a convert in the crowd? 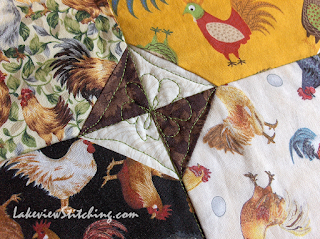 Despite your frustrations with it, the interior quilting on your Hen Party looks lovely. It's a nice combination of stitch in the ditch with free motion. Too bad about the straight line stitching in the border, but I think that a stipple should solve the problem quite nicely. Good luck! Not really, just a little doodling on long arms at shows. Thank you! I think it is another tool in my tool kit, rather than a full conversion. I may combine it with FMQ at home, we'll see how things develop. But it certainly is a better way to handle a large quilt. I wish my wrists were up to extended hand quilting, but they aren't. The long arm uses a completely different set of muscles, so I have high hopes! I have never tried a long arm, but I would love to. Maybe it's time to give it a whirl! I love Hen Party because I love novelties plus I have a lot of Hen fabrics too. I like how you chose to quilt it. I didn't know there was batting that allowed 10 inch spacing. How do you like it compared to other battings? 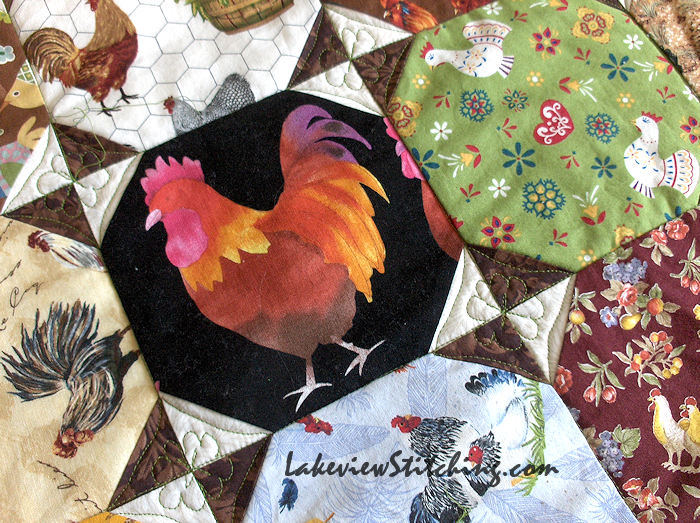 Glad you found a new way to get quilts finished. 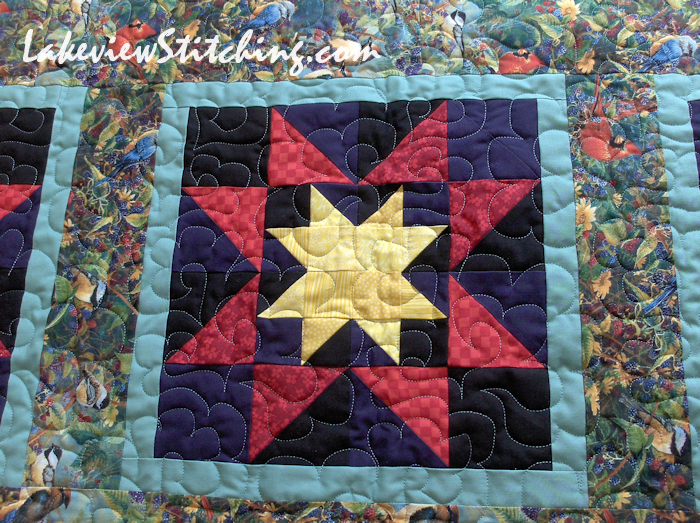 I like to make big quilts too but the quilting does take a toll on the body. Sorry about the unsewing. That can be so frustrating. But it appears you've added a new tool to your tool belt with the rental time. Looks great. Thanks, Terry! No, I didn't sew those straight lines in opposite directions. Would that have helped? On the full 12' frame, the long arm is a monster, plus, it's LOUD. I wouldn't want to have one in a small room. But, I don't think I would say no if I could find a way to do it! As far as the clover go, I think it's just a question of the lesser evil, marking or freehand. I still prefer an organic look, no matter how high tech the equipment! 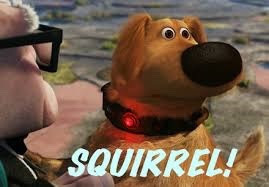 Exactly something that would happen to me! There's always an edge where the puckers or ruffling just 'happen'. :) Good luck getting the threads out and finished up and Congrats on getting the longarm thing figured out. I've tried years ago and was very frustrated with the process. My sister-in-law picked it up after one session like you!